It's Sunday, after waking up at Yoshi's place we got straight to work going over the contracts our translator Marie finished during the night. Bloody amazing, she did 10000 words of legal gibberish in 4 days. I was going to outsource some of it, but the rest of the world was at Easter and other companies that I could contact all gave a time frame of more than a week. Not bad for us considering we are not a translation service, I enjoy helping other companies with their globalization plans. Now she has to do another 20000 in the next 2 days, luckily its pretty much cut and paste, I have faith in her. Now I understand the real meaning of being a good boss, to trust those that are around me. After the first 10000 was approved and cleaned up Yoshi and our team went for a walk in Asakusabashi to enjoy hanami(花見). It was freezing cold, so we went and had some tempura right next to Kaminarimon. Hanami, literally means looking at flowers. Specifically it is the appreciation of cherry blossoms. Because the blossoms come and go so quickly it shows us the paradox how the beauty of life is so fleeting. One of the reasons Japanese culture is so grand - life's fragility is celebrated not feared. After tempura it was just too cold and wet to spend the day outside so we made business plans at Esspressamente in Ginza. After that we all enjoyed a browse at Maruzen book store. 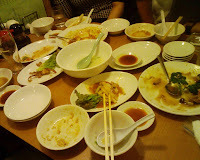 For a finale we ate Chinese, here is a look at the devastation we left behind. Now its off to home - at long last, I haven't changed my clothes in a few days. I have a little more FujiFilm code to do tonight. Tomorrow I have to get stuck into R&D plans for OLM digital. 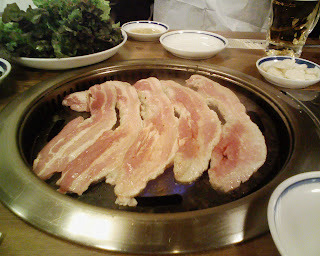 Afterwords I went out with Yoshi (Nexus) we had Monja yaki and crashed over his place. Discussion was about clients who book work and cancel, wasting our time. office take a nap and prepare for the next days work for FujiFilm. 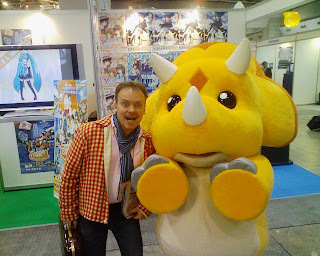 Yesterday I attended the 2008 Tokyo animation fair. Anyway it was a blast. Lots of cutsie stuff there. Both yesterday and today are the business days. Saturday and Sunday it is open to the public. Sort of funny hey - cartoon characters everywhere and not a kid in sight. Hey this is serious stuff here, land of the rising fun. Digital laboratories - R&D, great things you may see in the future developed here in Japan. Canada - like japan is animation nuts, good software, wander around to see their demos. Mad House, just a good booth. Please note that on the public days lots of good business booths will not be there. Pubic days are more oriented to children and otaku, in other words - goods characters etc. Eventually got through to the people in London, they explained it was Easter. After staying up till morning organizing my Europe team and later organizing people here in Japan - a backup plan. Its now 1830 - time for a shower, then dinner with the boss Ichiro Tanaka, and David Lin from Indyzone, also Sidefx's (Houdini) David Robert and Leyla Tigari. I was going to invite them to one of my favorite Yakitori places in Shibuya. Unfortunately I think the place I planned may have closed down. I did have a standby place marked however that was booked out. Tanaka San knew a better place nearby Kaikaya (開花屋) which was spectacular. The chef was a jolly Japanese man, you can tell he really loves his customers. The food was amazing, Tanaka San explained that the chef was Iron Chef material. If you ever go there you have to try the cheese tasting prawns - bloody amazing. I mean who cares about calories and cholesterol - flavor is much more important. Belissimo! I was up all night trying to contact my translator in London, I can translate however legal documents are not in my skill list. Anyway just realized that he is on Easter break. Easter, is nonexistent here you see. Ok, ok -new resolution I have to talk to my foreign friends more. Easter, that's the one with the bunny right? - just joking. he will go far over in LA. Afterwords the SPI guys, ATR, OLM Digital R&D team, (including OLM's incredibly hip boss) and I all went out to partake in an Italian feast at Il Pizzaiolo . We all had a little too much wine so the atmosphere was fantastic. Man I love my job, its great to meet people you respect like today. I suppose I am lucky to have such good friends. Now I have to go back home, contact the London office and organize some paperwork for another company -its daytime somewhere . Its official, one of the short films I was working with has been chosen for showing at this years Siggraph. Sorry I cannot mention anymore until the official release day. I have been in bed with the flu. Great to hear such good news. 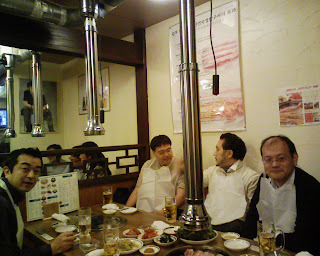 Shimamura san and I just had dinner with the head of strategy and contents producer from Capcom/Daletto. They were impressed by what we showed them and we were asked to go around to Capcom in return. Capcom is very close to my office so this is great for them and us. Unfortunately both were suffering due to hay fever as it has just turned spring here. Hopefully we can get back into games as my last game project with Sony/Enterarks was a hit. 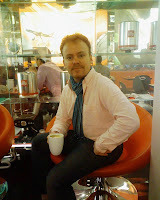 I was in OLM today we were contemplating some new ways of handling the new object oriented shaders in Pixars Renderman 13.5. and how to interact with ODE, Bullet physics or even better Cuda. Cuda is good however it's not a dynamics engine, it's truly a black box. After that I went back to the office to contemplate a Cuda<>prman13.5. Later at 7.30 I had a party with my co-workers from my last company, Monolith. One of the directors there Akira Ayabe is leaving to have for a more serene life in Miyakojima. I was happy and sad at the same time, he is going to have a good time there, however he is one of the reasons I have stayed here. A truly good Japanese director, I hope I can still work with in the future. coming up codename "China" and I cannot afford to be sick. 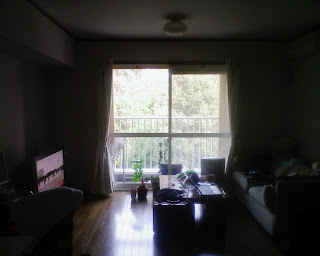 Medicine was the tree view which is great from my home. lately. I think I am coming down with a cold just as winter ends too! 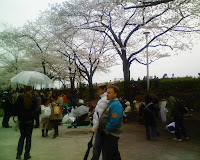 Cannot wait for cherry blossom time, that's my favorite time in Japan. capsule hotel or having a sento and staying back at the office. cant hack the stress, and jumps under a train. Then the train is delayed, so the thousands are backed up on the platform waiting for the staff to clean up the mess. Today I worked from home. I had spent all weekend doing work and with clients. 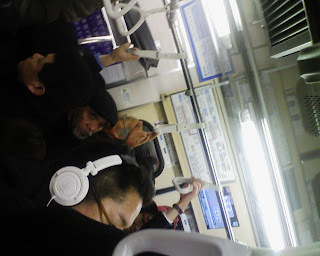 Sometimes its nice to work away from the bustle of Shinjuku. Eyedentify Matsuki with Indyzone's Tanaka san and David who just came over from San Hose came out to Nexus on Saturday. 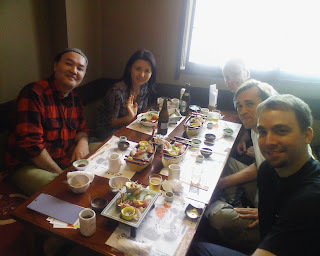 We later went out to our favorite restaurant Muran(ムラン). Here they grill pork on huge crystal slabs. Really great stuff. David and Myself with Shimamura went out partying till 10am !! - Well we wanted him to have a good time out - with the champions. 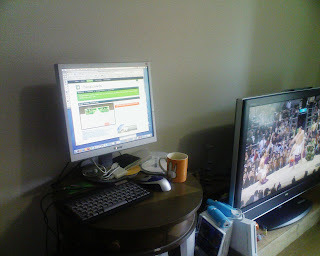 # this is good for a paranoid user who only wants tickets when logged in. # view the readme there, everything is explained crystal clear. # the first entry in /etc/hosts then reboot. # so an admin from another os can easily admin. # Better still have links to the native paths like I do. # users on the lan and be secure at the same time. As is the usual problem I have to link Windows with Linux and with OSX. Windows has only one true commercial nfs client from hummingbird, this borked on my XP x64. Linux no problem , I built and modified the lot from source. OSX well, it has kerberos with nfsv3 and there is a great nfsv4 version from Rick Macklem http://snowhite.cis.uoguelph.ca/nfsv4/ however the problem lies with Apples gssd implementation. To put a long story short you must log in to get a ticket. So this leaves my dream of having deamons using kerberized nfs in the background gone. > I was trying to get nfsv4 mounts pre-login. > Yes I have tried tickets with k5start, and self built kinit. > a File based cache. > Have you had any luck with pre mounting nfsv4 on apple? thought others might find the info useful. Today I attended the Open source conference Japan again, there was noticeably more people compared to yesterday. There were better sessions too. I met William Baxter (OLM research) there. He was there for the D programming BOF. I couldn't attend the D BOF that as I am really interested how others have been applying Ruby. Later in the day there was a great Opensolaris meeting.